Cross-Country is known as being the optimal aerobic exercise. It is a rhythmic movement outdoors, involving fun, socializing and relaxation at the same time. Planica Nordic Centre offers 800 metres of cross-country skiing track in an underground snow tunnel. From May till the end of autumn skiing enthusiasts can use natural or artificial snow. The snow tunnel extends over 3 floors, the interior temperature is around -2°C. If you miss winter, then the indside ski tunnel is the right choice for you. 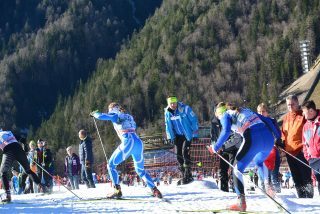 It provides excelent conditions for proffesional athletes, as well as for skiing enthusiasts. 2 hour-run would cost you 9 EUR. You can borrow the equipment for cross-country skiing all year round at the Planica Nordic Centre. The equipment is available for starters and experienced runners of all ages. I WISH TO RUN IN PLANICA! Call us, contact us or visit us. We will be happy to help you.